Peak Oil Debunked: 62. DO HIGH OIL PRICES PROVE THAT PEAK OIL IS HAPPENING? 62. DO HIGH OIL PRICES PROVE THAT PEAK OIL IS HAPPENING? Why did prices go up in the 70s? There must have been a reason. Not even speculation? Help me understand this. I definately agree that high oil prices dont mean that we've hit PO. Why?? Because the price of crude only makes up half of the price of oil. The other half is purely speculation...and other things. So if oil today costs around $65 a barrel, the actual price of crude costs somewhere around $30-35. 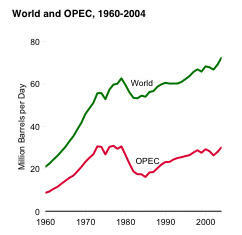 That doesn't seem to point to a decline in oil production to me..but i'm not a geologist either.